Pre-heat oven to 170°C/330°F. Grease a spring form pan with butter. Peel and grate carrots and set aside. Separate eggs in two small bowls. In a large bowl mix flour, ground hazelnuts, and baking powder and set aside. Add almond paste, egg yolks, and cinnamon to a separate large bowl and blend with an immersion blender until smooth. With a standing hand mixer continuously beat until the mixture turns lighter in color. Set aside. Mix egg whites, sugar, and salt and beat until stiff in a large bowl. Fold in beaten egg whites into almond paste mixture. Add ground hazelnut-flour mixture and grated carrots. Stir gently to combine. Transfer batter to the springform pan and bake at 170°C/330°F for approx. 40 min. or until a toothpick inserted into the center of the cake comes out clean or with a few moist crumbs. Remove cake from oven and allow to cool. Place sliced almonds on a baking sheet and roast in oven for approx. 10 min. or until golden brown. Remove from oven and let cool. Sieve confectioner’s sugar into a small bowl, and add water to make a thick icing. With a palette knife coat cake with apricot jam and evenly brush with icing. 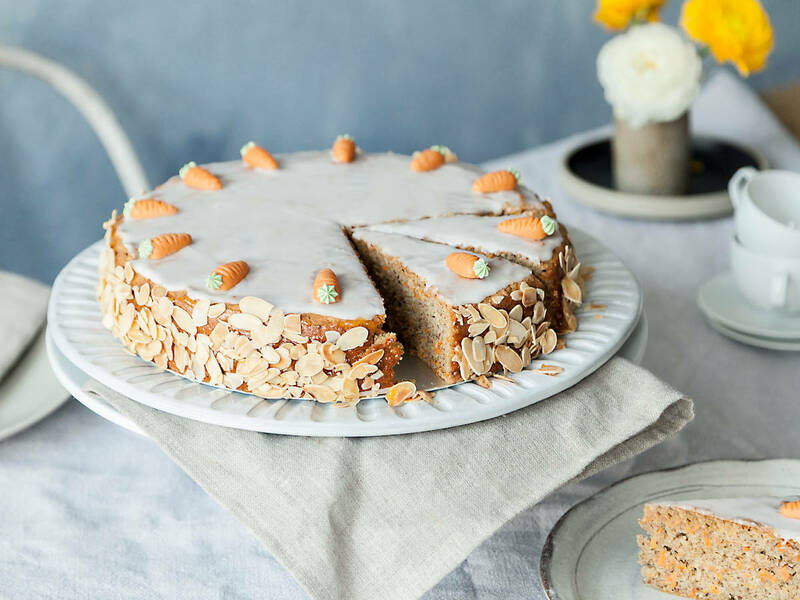 Decorate sides with roasted almond slices and the top with marzipan carrots. Enjoy!